JERUSALEM/ROME (BosNewsLife Columns)-- The man claiming to be the Messiah miraculously appeared before his friends and followers Sunday, April 1, after He died at a cross on Golgotha hill near Jerusalem's walls. Christ Jesus had been tortured and crucified to death Friday, March 30, by Roman forces, after Jewish crowds rallied against Him for calling God his Father. He also made clear he is the Heavenly King who will sit "at the right hand" of his Heavenly Father, giving eternal life to everyone who believes in Him. Medics could not explain how he managed to cheat death. Such long-term resuscitation is currently impossible for people whose cardiac arrest is accompanied by injury from trauma, with crucifixion being the most painful death on record. "Therefore go and make disciples of all nations, baptizing them in the name of the Father and of the Son and of the Holy Spirit, and teaching them to obey everything I have commanded you," Christ added during the gathering. "And surely I am with you always, to the very end of the age,” Christ pledged. There was no immediate news conference planned with media. The gathering came after a close friend, Mary Magdalene, said in a statement that she initially had been crying after not finding Christ's human remains in the Jerusalem tomb where followers hastily buried Him in time for the Jewish Sabbath. One of Christ's well-known 'disciples' Simon Peter acknowledged that he was initially shocked when Magdalene said: “I have seen the Lord!”, an announcement that turned her into the first known evangelist. Soon after, Peter said, he also "saw Jesus" and realized that "God raised him up the third day, and shewed him openly." He added that Christ appeared "unto witnesses chosen before of God, even to us, who did eat and drink with him after he rose from the dead." Roman Empire officials had no immediate comment, but followers of Christ said they expected persecution. Soldiers guarding the tomb appeared concerned. 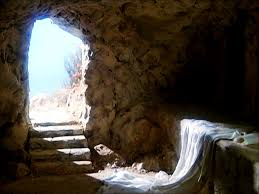 They played down claims that Christ conquered death and sin in His resurrection on the third day, saying "His disciples came during the night and stole him away while we were asleep." The military did not address several reports that soldiers had been paid to make the statement by chief priests opposing His activities and were worried about repercussions from the Roman governor. Jesus had been predicting His death, at the age of 33, and resurrection. He viewed it as a mission to die for the sins of the world as He made clear that the wages of sin are death. His resurrection symbolizes that sins have been forgiven and that the gift of God is eternal life for every person turns to "Christ Jesus our Lord," followers said. Friends quoted Christ as saying: "I am the resurrection and the life. He who believes in me will live, even though he dies; and whoever lives and believes in me will never die." firstly the son of God was Adam, Adam conceived Eve Adam and Eve had a sexually relationship that how mankind evolved according to the bible as told by the Jews themselves. Next events were all war stories to gather support for Jews who were illegally seizing land from sematic tribes the exodus never happen as per Mose bible infact it was Mose fathers who help mose plan the escape 40 years before hand Mose used the sematic people against Egypt to plot his ambition to be a leader of a nation of followers. Hitler was dead right about the Jews we are seeing it every day just how nasty deceptive, murderous they are towards other religions, and those who support palistein. You clearly did not read the Bible. And Israel is the only functioning democracy in that part of the Middle East. Talking about a lack of respect for other religions: tell that to the Christians facing persecution in Iran, Egypt and other countries. The Jewish people, as part of the people of Israel, have a special place in God’s plan. No Hitler was not right. And I wouldn’t like to be in the place where I believe that monster is: eternally separated from God.